Just wanted to let you know that I am very happy with my entertainment unit which was delivered by two lovely gentlemen. Finally got what I wanted….thank you so much!!! Thank you for all your excellent service, product knowledge and assistance with helping me choose colour, product, fabric and styling ideas for my purchases in this past 12 months. I accidentally discovered Naturally Timber and it is one if the very best things that has ever happened to me and the decor of our home. I have beautiful pieces of furniture and cushions that are not only stunning and different, they’re also comfortable, conversation pieces that will have lots of memories and pieces that are going to be enjoyed when we have family and friends come to our home. Thank you guys for the memories, style and comfort. Without your professionalism and style to recommend and sell the product, along with those amazing people who work in the factory to actually make the product, Naturally Timber would just be another furniture and decor shop. Your employers should be very, very proud of you. Hi Emelia, just wanted to say what a fantastic job you all did at Naturally Timber. From Con to yourself and then meeting your dad and his workers was a pleasure. I asked if you could match my cabinet to the table you were custom making and as you can see from the photos it is perfect. Could not be happier. The delivery guys were unbelievable as well. So friendly and helpful. Hats off to Naturally Timber. Would recommend any time. Have just returned to work and saw the table! Absolutely love it!! Thanks again for all your help, appreciate it! My order was delivered two weeks ago, and I am delighted with the furniture. The Denmark buffet is particularly pleasing. I like the fact that it has ease of movement which means that even when full, I am able to move it easily to reposition, clean behind etc. Provision of a few extra little brass shelf supports was thoughtful. The wood colour match is very good, not only to existing woodwork, but to the other furniture forwarded. The clean modern lines and workmanship are as I hoped. It was so easy to arrange the design and order of the furniture from interstate. My fiancé and I have been dealing with Cora with regards to various items needed for my clinic. Not only has she been patient and understanding our needs, she also has given excellent advice and is a very talented designer. We both wanted you to know how wonderful she is and that our decision to go with naturally timber had much to do with her. We have no doubt the furniture is made with love and attention. Just wanted to say a huge thank you to you and your team for the beautiful table – it’s absolutely perfect and better than I imagined. The people who made it are incredible and the delivery guys were great in managing to get it into the apartment. Thanks for all your help in getting it to this stage – has been such a smooth process and probably one of the best companies I’ve dealt with in regards to customer service. Our new bed was delivered from your company this morning and I just wanted to send a note of thanks to you, with particular thanks to the two men who made the delivery. They did a great job, were very pleasant and efficient – and then offered to move the mattress onto the new bed, which was a huge help to me. The bed looks great in our bedroom and I’m very happy with it. Thank you and your Naturally Timber staff for doing such a great job with our new dining chairs. The leather and timber colours match the samples perfectly, and our diningroom setting is now complete! Thank you and the workshop guys for trimming down our table legs. It’s perfect and we love the table. Your excellent customer service and friendliness is very much appreciated, and we will be sure to recommend (Naturally Timber) in the future. I would like to thank you and the other people involved with repairing our Oslo Bed, especially the delivery guys. The repair looks great. We understand things like this happen, it was good to be able to go back to the store and have the repair done quickly, efficiently and without debate. If we had purchased this bed from any other store we would have not received the same service as Naturally Timber. I have mentioned your after sale service to people who recommended your store to us and they were pleased to hear that if there is a problem that they could go back to Naturally Timber. They are considering a new dining table in the future and they will be definitely going back to you. Also, if we require a new piece of quality furniture we would be very happy to come back to Naturally Timber. Again, thank for your great after sale service. I went into the Naturally Timber store in Auburn and fell in love with this giant table with pink chairs, but I live in a small cottage so I asked Con if it was possible to make it smaller with pink bench seats. Con drew up the design with me in store, asked when I wanted delivery and I asked if it could be before Christmas he said it would be tight and that the timeframe might not be possible (I think it was the end of November when we were having the conversation). My beautiful table was delivered and installed the week before Christmas and I can’t wait to get the matching TV stand. Our Denmark dining table and Vogue Leather dining chairs arrived yesterday and we are both over the moon with how perfect it all looks. Thank you for the superb service and your attention to detail. My husband and I were after two bespoke pieces for our new home using the finest hardwood Australia has to offer. Naturally Timber created just what we wanted, a chess table and a dining table, both exquisite examples of Australian craftsmanship. The attention to detail and the workmanship is second to none. These pieces will be in our family for many years to come. I would not hesitate to recommend Naturally Timber to anyone looking to have beautiful furniture created just for them. We love our table. You did an amazing job of coaching us through the process and the outcome is awesome. Thank you for your time, patience and expertise. Also thanks to the guys in the warehouse who made the table, their passion and love of what they do is evident in the table. We would highly recommend Naturally Timber to friends and family. Recently we purchased a custom design Madrid dining table in Spotted Gum and a custom design Lawson round table in Tasmanian Oak. Our tables are well crafted, beautiful, solid pieces of furniture that will last a lifetime. 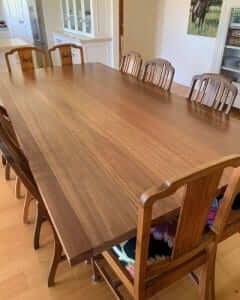 The timber of our large dining table is exquisite and exactly as we had hoped for. Both pieces enhance the rooms they inhabit and bring elegance and warmth. Todd and Emelia at Naturally Timber made every part of the design process an absolute dream and they followed that process through, personally, and with genuine concern and interest, from our initial conversation to the table’s delivery. From the outset it was clear that this company takes pride in its work. They were incredibly enthusiastic and passionate about their product and totally dedicated to excellence in customer service. Everyone I dealt with at Naturally Timber had that rare ability to make me feel as if I was the only customer they were dealing with that day. I was unable to get to the showroom to view tables in the various woods firsthand, so Todd sent as many images, and spoke with me on the phone, and emailed, as many times as was needed, for me to make an informed choice. He even sent a wood sample up to Tamworth with a rep who was passing through who hand delivered it to our home! His suggestions and feedback through the process of selection of table models and timber choices showed sensitivity to our needs and considerations of the other woods we had in our home. The design process was extremely professional. Our existing dining chairs and how these would sit around the table, the size of the space for the table, the colour and patina of the wood were all taken into consideration. Then clear, annotated, computer generated drawings, from different angles, with all specific measurements were emailed for our approval before manufacture. 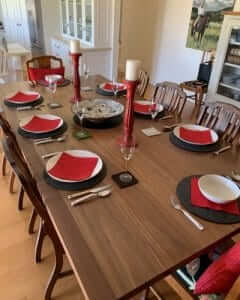 The tables were made within the timeframe discussed and when a hiccup with delivery (and absolutely not Naturally Timber’s fault) threatened to mean they might not arrive before Christmas, the staff went above and beyond to ensure that they did. If you want personalized, caring service and a solid piece of quality furniture at a competitive price that will last a lifetime, talk to Naturally Timber. I guarantee you’ll be happy you did. I would like to thank you both for your patience, professionalism and excellent service! We were extremely happy with the service we received by the staff at Naturally timber. Our custom made bedroom furniture was outstanding. We highly recommend Naturally timber for all furniture purchases. After long planned home renovations and refurbishment we have bought a beautiful Blackwood dining table and chairs, plus several coffee tables, a bookcase, bedside table and assorted lamps from Naturally Timber. We are very pleased with our new purchases and with the high level of service and friendly help we received from the staff at both the Auburn and Stanmore stores. The staff at Naturally Timber made furnishing our house as smooth and easy as possible. They were patient, understanding and took all our needs and thoughts into consideration. The outcome is an amazing custom dining room setting which is complimented by every person who sees it. I can’t wait to furnish our bedrooms with this wonderful company. Thank you Peter, Con and Emelia for all your help and services in this order. I will certainly recommend you guys to my friends and clients, not just the products, and the great service also. Just wanted to let you know that my client at Morpeth is thrilled with her furniture. Everyone who sees it compliments her and she is so happy. Just wanted to touch base and say a big thanks for the River Gum dining table I bought from your Auburn store. I was totally out of my depth and didn’t know where to start with the wide range of choices that seem to be out there. I emailed some photos of my dining room and the team were able to help me choose a table that stuck with the decorum. Thanks for the patience and advice! I love my new table! Thank you for the Myrtle bookcase that you had made for me as a special order. It was delivered on Friday and I am delighted with it. It looks terrific, the Myrtle wood looks great in my study. It is a magnificent piece of furniture. The delivery people were terrific. It was hard to get into the room and they did a terrific job of installing it and putting it together. They were friendly and courteous. It has been a pleasure working with Naturally Timber. Please say thanks to Con. The fabric he chose for the armchairs for my sitting room looks absolutely gorgeous. My husband gave me free reign and I think he is still in shock at how good they look! Thank you for being so great with our table and chairs. It was such a refreshing experience to be treated so helpfully even after the sale went through. I know I’m a stress-head but the beautiful furniture arrived yesterday as promised, so thanks. I have worked in retail all my life and can’t tell you how nice it is to have been treated so well. (Your staff member) was very helpful and polite. Pass on our appreciation please. I just had my new apartment fitted out with a customized TV cabinet and bookshelf. As well as helping me come up with the design to fit the small room, Con and the team at your Auburn shop were incredible through the whole process. It was delivered yesterday and the delivery team even helped set it up. Looks amazing, adds so much space and appeal to the room. Please pass on my regards to all those involved, it was a really great experience. I’ve been involved in the woodwork industry for a long time and it was not by chance that I came to Naturally Timber for my new dining table. Can I just say that it completely lived up to my expectations. My Tasmanian Blackwood dining table came yesterday and I couldn’t be happier. I hope you keep true to your focus on Aussie hardwood products. Just had my custom Jarrah bedroom suite delivered. I love it! Cora and Bill helped me come up with a great design that really was what I wanted. Thank you for our new coffee table! We love it! The delivery team were really polite and helpful. I just wanted to touch base and say thanks for everything. I came to your Stanmore shop with a vague idea of how to redecorate our dining room. A couple days later Adam came over and helped me plan everything. He advised on the style and best size for the room as well as a matching sideboard. The advice he gave was personalized and relevant, without pushing me into anything I was unsure about. The table looks beautiful in the room. I’ll call you when I’m ready to redo the bedrooms (as soon as my husband lets me! ).